New photos were added on February 17, 2019. 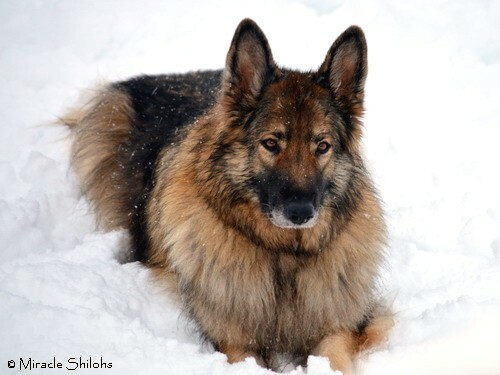 Tova came to us from O'atka Shilohs in New York. Tova's name is from an Old Norse variant of Tove, which means beautiful thunder. Not only is Tova beautiful, but she has a sweet and gentle personality. She is easy to live with, and is treasured by all! Through the achievements of her offspring, Tova's garnered enough points to earn her a spot in the Breed's prestigious Registry of Merit! Tova is Breed Champion. She was also the WSSBA's Grand Victrix for 2014 and 2016! After making a significant contribution to our breeding program, Tova was retired in April 2017. This very special girl will continue to share her life with Jan, daughters Cherry and Piper, and grand-daughter Camden at Miracle Shilohs.